Start your cluster headache education right here. We’ve got everything you need to know from finding the right doctor, getting the right diagnosis, and disability and labor laws. Cluster headache, nicknamed "suicide headache", is a neurological disease that involves, as its most prominent feature, an immense degree of pain. 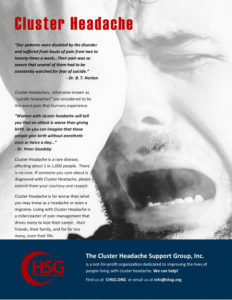 "Cluster" refers to the tendency of these headaches to occur periodically, with active periods interrupted by spontaneous remissions. The cause of the disease is currently unknown. We could go into great detail, but maybe it's better if you hear from real patients. Although not part of the official diagnostic criteria, many people living with cluster headache describe a low-level persistent headache that can be a precursor to full-blown cluster headache attacks. We call these "shadows." Read patient descriptions of this unique symptom. Our members answer your frequently asked question. These brief answers contain links to more detailed information found throughout our website. Medical terminology can be confusing, so we've compiled a glossary of commonly used terms in the world of headache medicine. Cluster headache is rare, but not as rare as many doctors think. It is also more common in men than women. Some female patients have reported decades of improper medical treatment due to an inaccurate diagnosis simply because the doctor believed it was impossible for a woman to have cluster headache. The best way to minimize the risk of misdiagnosis is to seek help from a specially-trained neurologist who is board-certified in headache medicine. There are a few ways to find a good specialist. For cluster headache, the average time from onset of symtpoms to accurate diagnosis is 8 years. Unbelieveable, right? Whatever the reason, it is important to get the right diagnosis as quickly as possible. Given the hundreds of possible headache disorders, that can be challenging, even for the most skilled doctor. Take a look at these common headache diagnoses to understand the complexity. We care about your safety. Please know that there is help available. If you are thinking about harming yourself, please take a minute to call 1-800-273-8255 or visit http://www.suicidepreventionlifeline.org and talk to someone. If you don't think you can maintain personal safety alone, please call 911 or go to your nearest emergency room. Specialists trained in suicide prevention will be available to help.